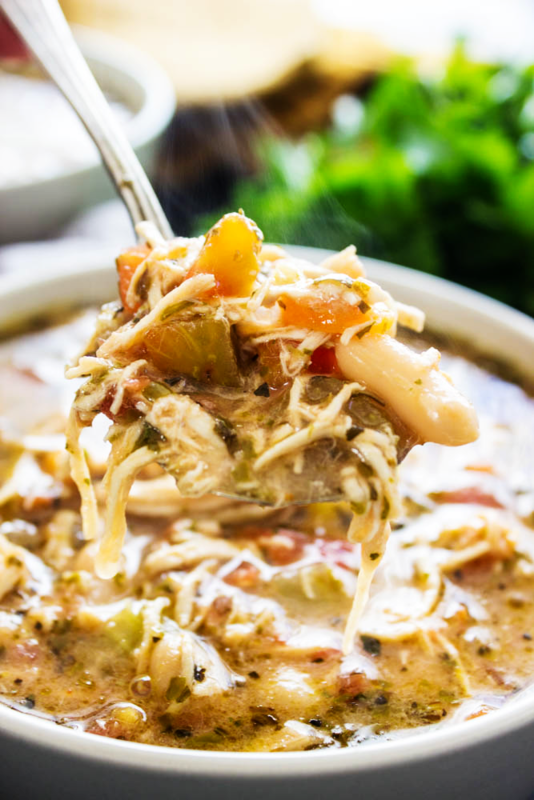 Hearty and full of flavor this Slow Cooker Chicken Soup is simple to make. With a creamy broth base, loaded with vegetables and pesto, this chicken soup is insanely delicious. Pin it to your SOUPS BOARD to SAVE it for later! I love making easy, delicious and flavorful soups, it is one of my favorite meals to dish up to my family. There is an added bonus in it for me if I can make it in the slow cooker. 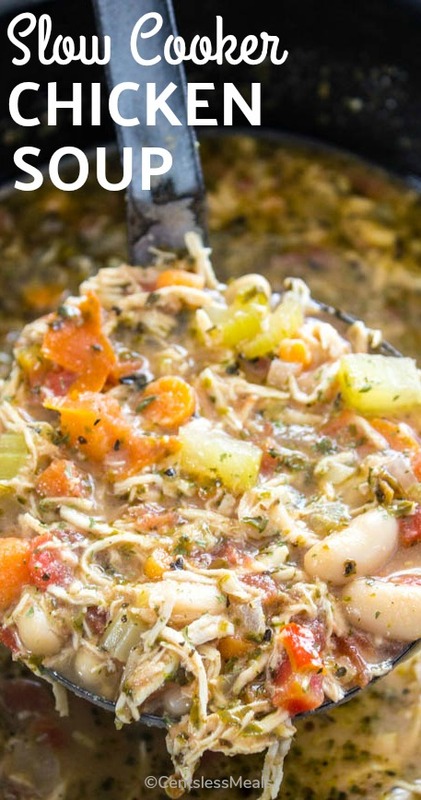 While you have your traditional chicken soup recipes to make in the slow cooker like, slow cooker chicken tortellini soup and slow cooker chicken noodle soup. 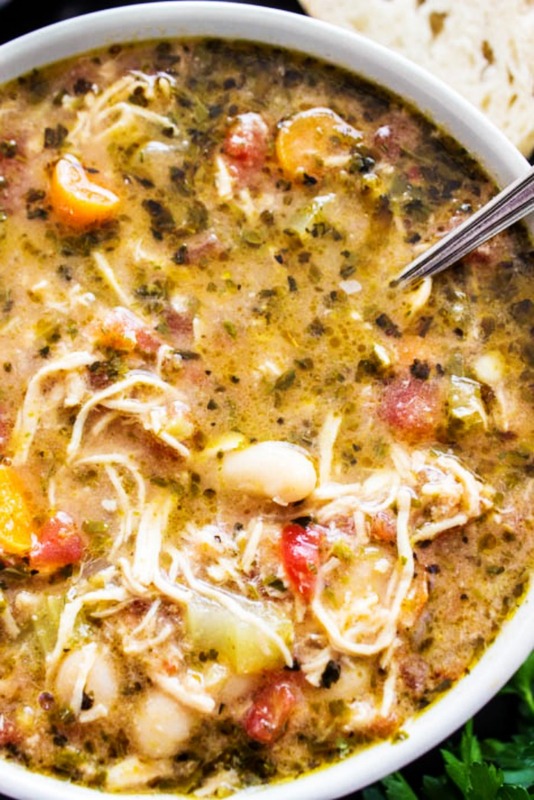 This recipe elevates all other chicken soups. 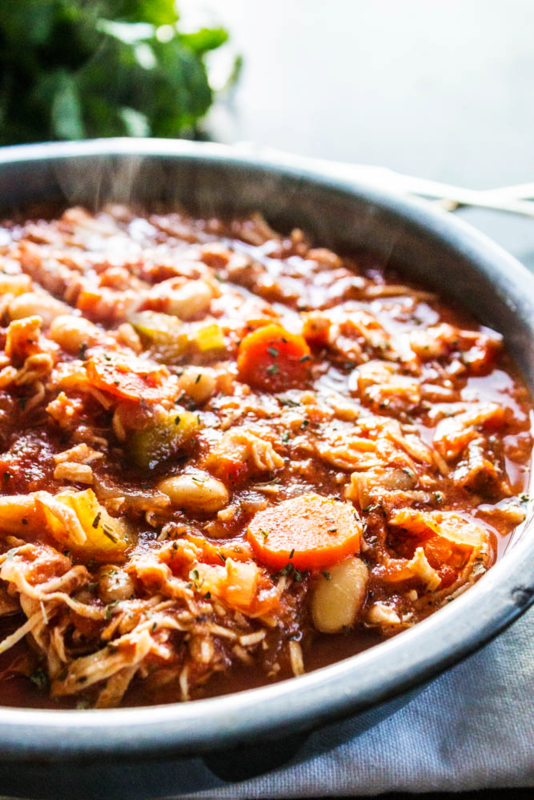 I love my recipe for slow cooker white chicken chili and this recipe inspired it. Using the creamy base from my white chicken chili, I simply took out the seasonings and replaced it with pesto. We love anything with pesto and I am pretty sure because it is made with cheese and basil, two of my husband’s staple ingredients in his diet. While I could have easily made homemade pesto for this slow cooker chicken soup, I decided to just grab a jar while I was at the store, simplifying the recipe and process. 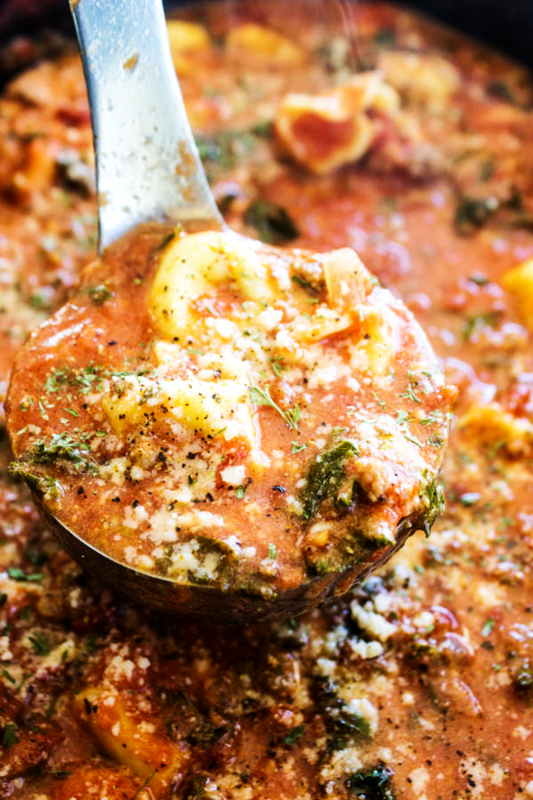 All of the vegetables made this soup stunning to look at. Loaded with carrots, celery, onion, garlic, tomatoes and cannellini beans this soup is wholesome and filling. This recipe for Slow Cooker Chicken Soup makes a large batch, making it enough to feed all 7 of us with a little bit left over. Now keep in mind I am feed 4 little kids and one teenager, so their portions are a bit different than ours but this would easily serve 8 adults accompanied with a nice green salad and bread. 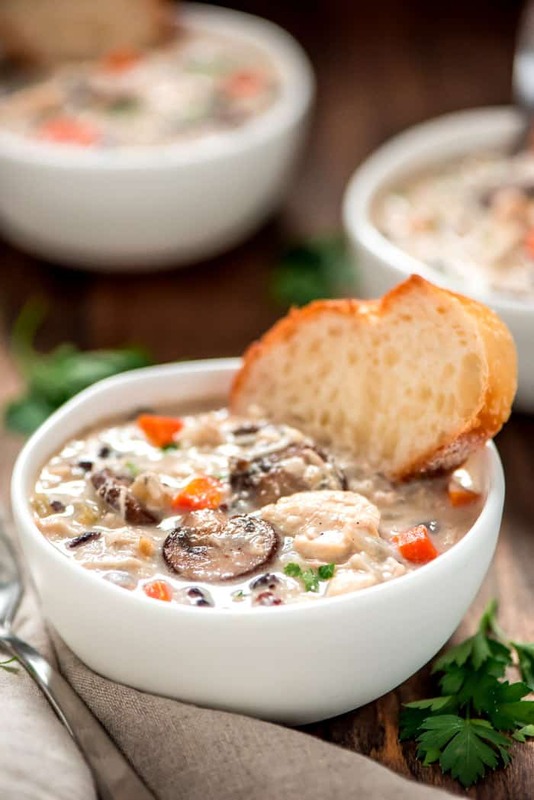 Chicken soups typically make great freezer meals and this recipe is no exception. Once you let this cook all-day, unplug your slow cooker and let the soup cool to room temperature. Then just fill 2 Ziplock freezer bags half way, full, zip shut squeezing all of the air out of the bag and place in the freezer by placing it flat. Then pull out when needed that day for lunch or dinner, allowing it to defrost and then heating it up either on the stove top or microwave. I love my slow cooker not only for easy last minute meals but for desserts and appetizers as well. Recipes like this Slow Cooker Chicken Soup always come in handy whether hosting a party, having company over for dinner, need a simple recipe for a cold winter’s day or if your are taking a meal to a friend. My friend Jamie recently had a baby, number 6 for her. I am amazed by her and beyond happy for them. They had 5 girls, before their little boy came along so you can imagine their excitement. Because their little one was born during flu season she really has stayed home with him, which I am so glad that she has been able to do this! I have taken a few meals to her and they have all been soup recipes. I am not sure if it because of the chilly weather we have been having or the fact that I can just load up my slow cooker and let it do it’s magic and then deliver it to her with such ease. Also, the soups I have been taking are just downright wholesome a delicious. Typically I make broth based soups for dinner because their and lighter, yet you can load them up with veggies that there is enough substance to make you full. 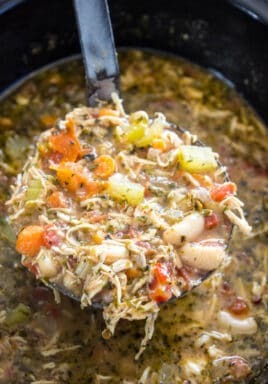 So if you are looking to try something new in your slow cooker, try this Slow Cooker Chicken Soup. Made with Italian seasonings and pesto, your whole family will devour this. 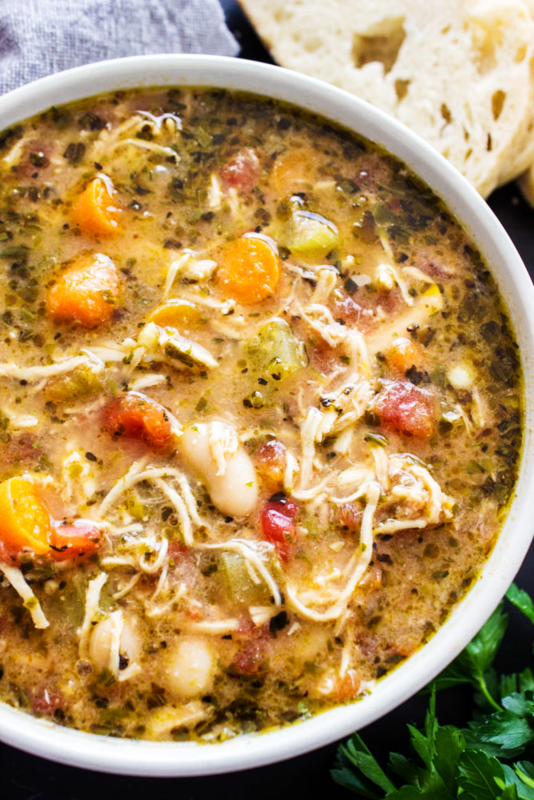 Don’t forget to pin this recipe for Slow Cooker Chicken Soup to your favorite Pinterest board for later. 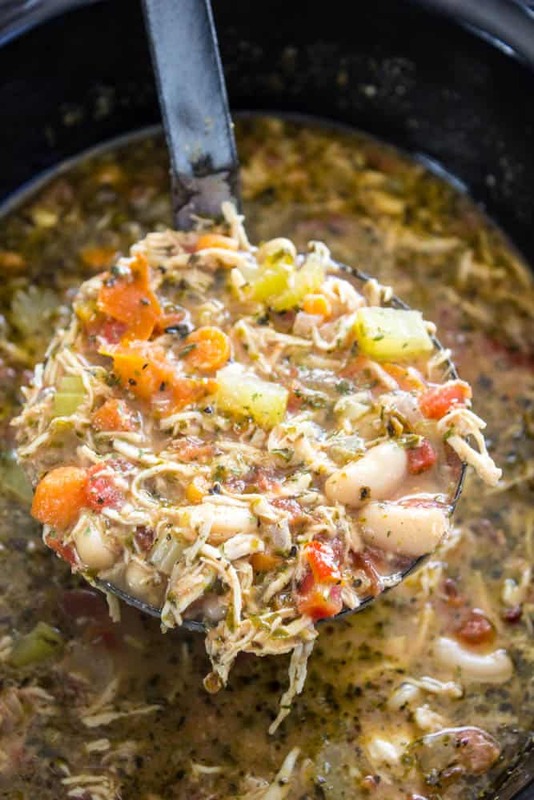 Hearty and full of flavor this Slow Cooker Chicken Soup is simple to make. With a creamy broth base, loaded with vegetables and pesto, this chicken soup is insanely delicious. 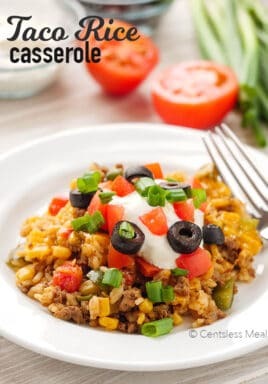 Add all ingredients except the white sauce to the slow cooker. Gently stir to combine. Cook on low 6-8 hours or high for 3-4 hours. 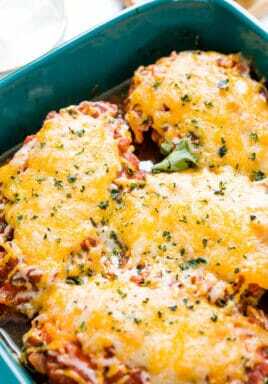 Once the chicken is completely cooked, remove from the slow cooker and shred or chop into medium sized chunks. Add chicken back to slow cooker and stir to combine. Make white sauce. In a small saucepan melt butter over medium high heat. Once completely melted whisk in flour and continually stir until mixture is bubbly and cook for 2-3 minutes. Slowly whisk in the milk and chicken base. Allow the sauce to simmer for 4-5 minutes while constantly whisking. Cook until sauce is slightly thickened. Season with salt and pepper. Add white sauce to the slow cooker, stir to combine and cook on high for another 30 minutes. Garnish with parmesan cheese and a sprinkle of dried basil to give it a very rustic look. Sandra is no stranger to insanity. As a mother of 5, wife, obsessed traveler and foodie, she takes on life one bite at a time. Through the years, she's discovered ways to make life and dinner time easier while maintaining great taste. Blending her pre and post kids’ world into one, A Dash of Sanity is where Sandra shares fantastic recipes and travel tips with a family-conscious budget in mind. So if you’re looking for a sweet dessert, easy dinner recipe, or travel advice, Sandra hopes A Dash of Sanity provides you with an idea, a laugh, encouragement, or just a break from the everyday madness. Can you cook in the Instant Pot? I have only made the recipe as written Sue, but I’m sure it would work. Let us know if you try it. What is dried bail? I am assuming basil because of the flavor profile. Just curious. Picture looks like it has noodles , or is that shredded chicken? Chicken base is like chicken bouillon. You can find it at your local grocery store or online here. The directions mention chicken base, but it’s not in the ingredients list. How much do you use? Also, is it 1 tsp. of white pepper? 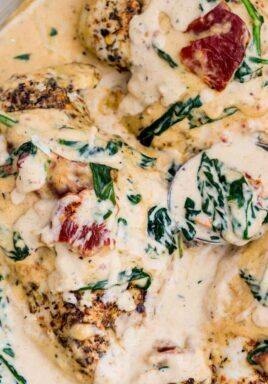 1 teaspoon chicken base will add extra flavor! Updated – enjoy, Carole! Thank you! I plan to try it this weekend! The amount of chicken to use is missing in the list of ingredients…I’m guessing 1.5-2lbs of skinless, boneless chicken breast, but would like to know what amount you use. I look forward to making this soon! 2 large chicken breasts are used for this recipe Sharon. Updated! 2 large chicken breasts are used Kate. Updated! We use 2 large chicken breasts. Thank you Stephanie!